Set in Mississippi in the early 60s, The Help deals with the world of segregation, when black women raised the children of white women, but weren’t allowed to use the same drinking fountains, sit in the same part of the bus and, as the movie says, often couldn’t even use the same toilet. Young, rather liberal, Skeeter (Emma Stone) returns home after getting a college education to find that the black maid she’s known and loved since childhood, Constantine (Cicely Tyson), no longer works for them, but nobody will tell her exactly why not. While all Skeeter’s friends are busy becoming wives and mothers – and never questioning the idea that the black women who work in their houses should be treated as second class citizens – Skeeter embarks on a project to write a book about these maid’s experience of lif. However she needs to recruit some of ‘the help’ to tell her about their lives. This turns out to be surprisingly dangerous, as it’s against the law to do anything that might encourage the mixing of the races, and any maids involved not only risk getting fired, but there’s also the threat of physical attack or even being killed. However Skeeter manages to get Abileen (Viola Davis), the maid of her friend, to help, as well as Minny (Octavia Spencer), who’s recently been fired by the vindictive, racist, social climbing Hilly (Bryce Dallas Howard) and is now working for Celia Foote (Jessica Chastain), a young woman who’s a bit of an outcast amongst the young, local, middle-class women. 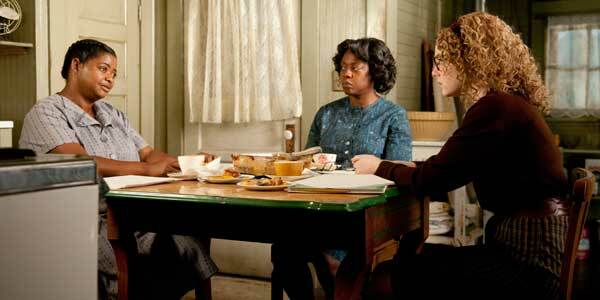 The Help was a big success when it was released in the US, but also rather controversial. Most of the criticism centred on the fact that the film (and indeed the book it’s based on) rather underplays some of the darker aspects of segregation in the deep south in the 60s, and that it also falls into the long line of movies where non-white people are only able to stand up for themselves and make a difference after a white person comes along to show them the way (think everything from Dances With Wolves to Avatar). There’s some truth in both these criticisms, but they rather miss the point of what The Help is really all about. For better or worse, this is a movie about the everyday racism of daily life back then, and deliberately told in a way that’s designed to allow modern audiences to relate to it easily and emotionally. It’s almost like a primer in segregation, introducing many of the issues without going into their full ramifications. Likewise the white heroine is used as a way to give white audiences an easy access point to the movie, and ensure that the lingering vestiges of racism don’t make people think this is a black film that’s just for black people (which happens quite often, although it’s rarely questioned). After all, it is everyday white people, many of whom would like to just pretend segregation never happened, who will benefit most from The Help. The film certainly gives you a feel for the truth of the ‘separate but equal’ doctrine, even if it is a rather sanitised truth. The film does sometimes have slight difficulty bringing to realistic life characters who are in some respects there to represent an aspect of early 60s life. For example, Bryce Dallas Howard comes off as the weakest in an remarkable bunch of performances not because she isn’t doing good work, but because her character, Hilly, almost becomes a cardboard cut-out bitchy villain. She’s there to represent the pernicious and ever growing nature of racism at the time, and how it was as much about demonstrating power and position as it was an absolute and unquestioned belief that black people were inferior to whites. However The Help has difficulty making her a living, breathing person at the same time. There are a few other characters and aspects of the film that can’t cover their heavy-handedness, but as mentioned, this is a movie chock full of brilliant performances that help cover some of The Help’s flaws. Viola Davis is simply wonderful as the world-weary Abileen, who seems beaten down by the world, yet has a fire inside her that can never quite be put out. It’s also great that The Help has finally gotten people to take notice of Octavia Spencer, who’s a wonderful actress who’s been stealing scenes for years in everything from Being John Malkovich to Dinner For Schmucks. She’s superb as Minny, bringing humour, attitude and heart to the role of Minny. However the best performance comes from Jessica Chastain in the supporting role of Celia Foote. It’s the sort of ‘airhead with a heart’ part that would normally make the character’s employment of Minny and efforts to be accepted in polite society just a humorous little aside to the main plot. However Chastain manages to pull a hell of a lot more from it, to the point where I sometimes wished the main focus of the movie had been Celia and Minny, rather than Skeeter writing her book. Chastain is utterly wonderful, and I can certainly understand why she’s come from nowhere to land roles in everything from The Tree Of Life to The Debt. The film is rather over-sentimentalised, and there is a slight feeling you’re getting the Disney version of segregation – where they’re admitting its bad but covering over some of the worst ugliness – but where it works splendidly is in trying to find the emotional heart of the people involved. Sometimes they may flirt on the edge between being personifications of a problem rather than persons in their own right, but thanks to some great performances, the lack of justice and a sense of the degradation inherent to what was happening back then comes through loud and strong. The Help manages to do all this with great humour. Indeed some have criticised it for being too funny. Some of this criticism comes from po-faced people who think you shouldn’t be allowed to laugh when a movie deals with racism (which is ridiculous), and also because some moments of light humour do mask the darkness at the heart of what’s happening. For example, there’s a moment when Minny picks up a stick to protect herself from a man she believes may be about to beat and/or kill her (and this being early 60s Mississippi would do so with impunity). It’s a bit disturbing really, but the movie plays it so lightly that the truth of the situation – that a woman’s everyday reality could be to genuinely think she could be murdered for doing the job she’s been hired for – doesn’t quite hit home. It’s an occasional problem of tone really, but there are moments when the film does seem to treading lighter than it needs to, and in its effort to ensure it’s entertaining loses touch with the truth of that’s it’s dealing with. Most of the time though it does manage to keep the tone light but with enough respect for the truth that it works well. The Help may not be perfect but it is perhaps the movie we need – a film with enough mainstream appeal to ensure a big audience (even if that means not really getting right down into the dark heart of segregation), who will get exposed to issues they probably rarely think about. If The Help causes some of these people to do a bit more research and find out more about the truth of what happened before, during and after the civil rights movement, then it’s done its job. Indeed just the fact that film will cause debate about its representation of a dark period in the recent past, has to count for something. Overall Verdict: It may have its flaws, but The Help also has a big heart, wonderful performances and works as a decent primer to the immensely complex issues surrounding the everyday reality of segregation.